Senior Matt Kleiman competes for a spot on the boys tennis team. Starting Monday, March 4, some of the best tennis players at RM competed on the courts for a spot on the varsity team. 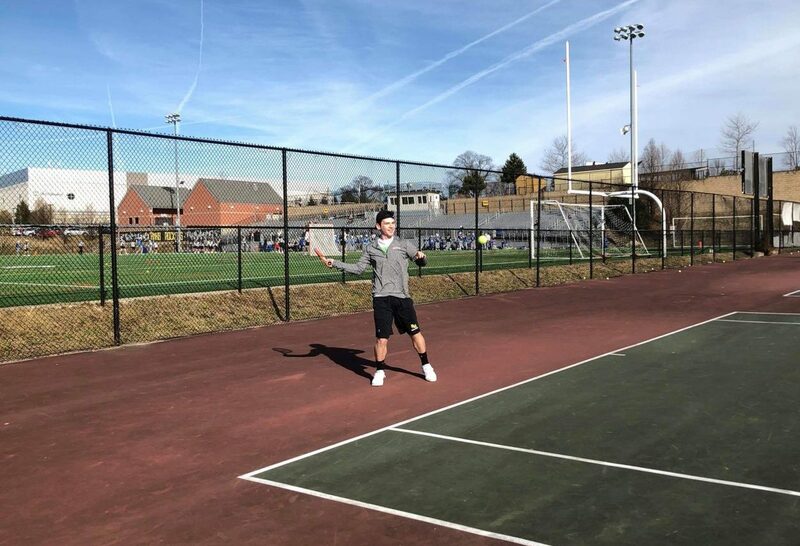 Yet, unlike past seasons, the girls and boys shared the courts as a part of a new policy moving both girls tennis to the spring season, the same time as boys tennis. This seemingly simple modification brought major changes to both teams, from smaller team sizes to new practice schedules. The change has also resulted in large changes to both team’s practice schedules. Traditionally both teams have met at around 3 p.m., but it is not possible to fit both teams onto the mere eight courts at RM. “Our practices are now one after each other, with us alternating who gets the early one and who gets the late one,” senior girls captain Shefei Jiang said. Though seemingly innocuous, this new scheduling has been one of the most frustrating aspects of the change for many. “To be honest, I’m not looking forward to to going home at 6 every day,” freshman Anurag Gowda said. Issues like these seem to affect both teams equally, yet in other aspects, the change has perhaps impacted the girls even more strongly than the boys team. With the change from fall to spring comes surprisingly stark differences in weather, which can greatly impact a player’s mood and performance. “In the fall, the weather is never too hot or too cold. However, the spring season is going to transition from really cold to really hot and I’m not excited,” Jiang said. Adjusting to the overlap with AP season has been another problem for many on the girls team. “AP season has always been a busy time, but now tennis is just another thing I have to juggle,” junior Katie Kolodner said. A perennial headache that the boys have come to accept, it is a new challenge outside the sport to accompany the pressures on the court. Despite these initial obstacles, both teams are still looking forward to another successful season. With an influx of new talent as well as many returning veterans, their hopes for high placements in postseason play are very high. “I’m definitely looking forward to playing doubles and hoping to qualify for county and states meets,” freshman Jupleen Kaur said.